Fascinating to see the intricacies and details that go into making up these displays. 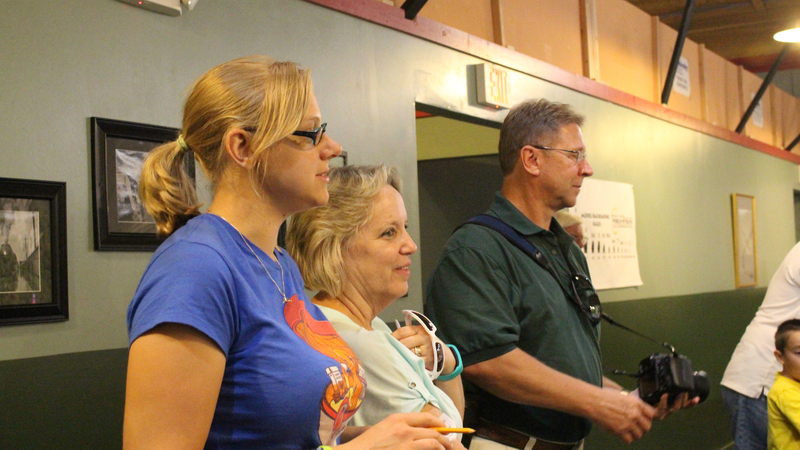 Volunteers show you behind the scenes and you can really appreciate their dedication. A MUST to take every young (or old) child to see! My THREE year old was memorized by the display for over 2 hours when we visited. We finally had to lure him away with the promise of food . We are very excited for the upcoming Christmas display. I am so happy you will be opening after all!! My little boy loves trains and I was thinking about having his birthday party at your facility in December. I was disappointed when I read that you were closing!! Very nice train museum! So much detail and very friendly staff. Fun "scavenger hunt" activity to do while in the museum. Fun for train enthusiasts of all ages! This is a great place for adults and kids of all ages. The volunteer staff was friendly and helpful answering questions and for a buck more you can go behind the scenes to see how the trains are dispatched. The mountain scenery is awesome and you can tell a lot of love went into the creation of Greenburg, a city inspired by Greenville & Spartanburg. Great way to spend time! 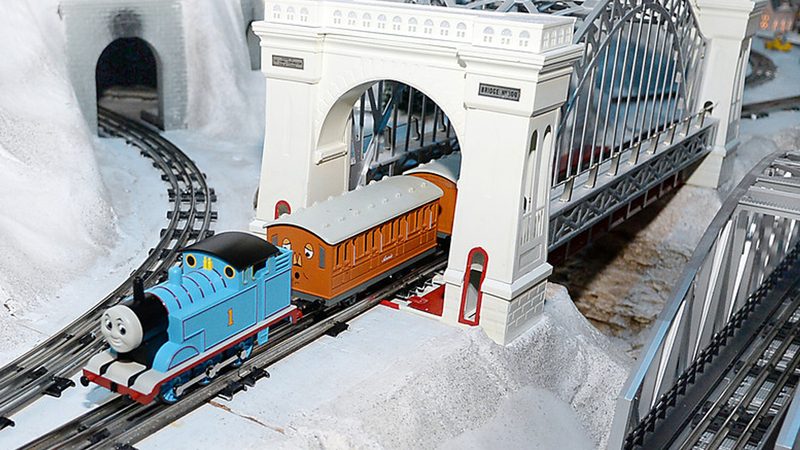 Is there a kid not fascinated by trains? Adults for that matter. For a small fee you can wander around the trains and look at the scenery. There are little buttons to push too which is extra great for kids! My children gave it a thumbs up!!! 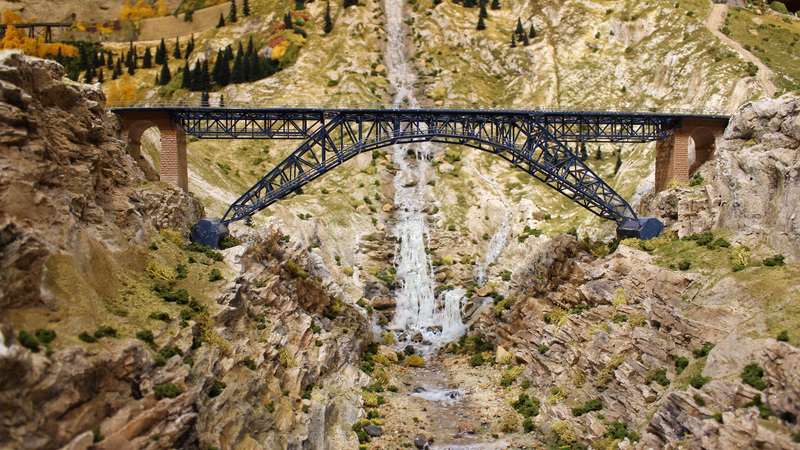 This is a great place to visit if you love model trains. The layout is huge and very detailed. The volunteers working in the layout area and at the front desk are very friendly and knowledgeable. 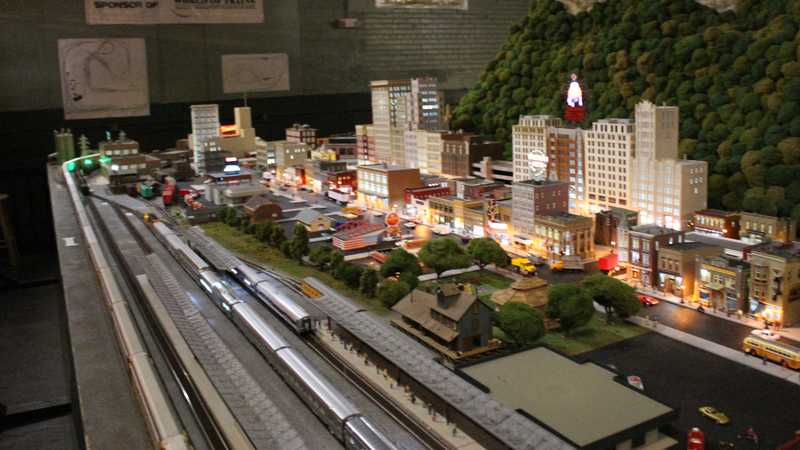 The layout is also displayed in daylight and in night time light. The location is right downtown in the historic area, there is shopping, restaurants, and other sights to see in walking distance. I highly recommend a visit. I visited your Museum a couple of weeks ago and was amazed by the details and realism of your trains. I have since recommended it to everyone that would listen. I found your Museum online. It was a very interesting layout of the Greenville/Spartanburg areas and the mountains in the middle. The many different city designs they had, along with the industrial and farmlands dotted with a variety of animals was quite impressive. Also the knowledge and the readiness of the volunteers working the display, to answer questions from both young and old alike, was excellent. It is an excellent place to take kids to enjoy. 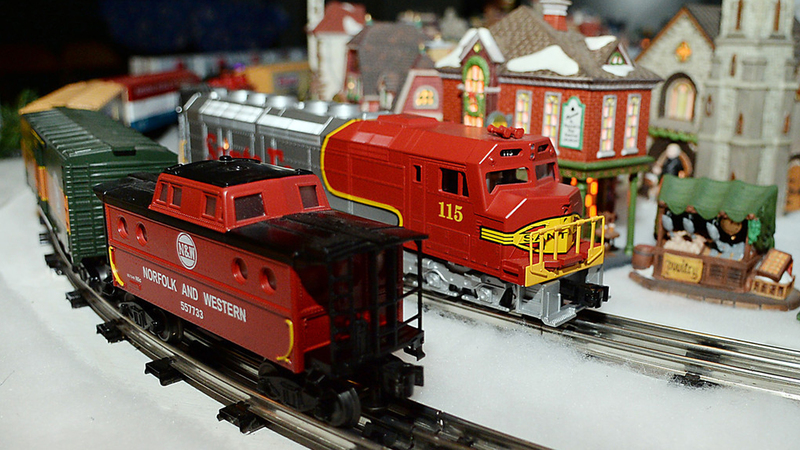 The HO scale trains(40 of them I believe) were something of beauty. Well worth the $5.00 admission fee, of which i believe some goes to local charities. Check it out if in the Greenville area. I don't think you'll be disappointed. 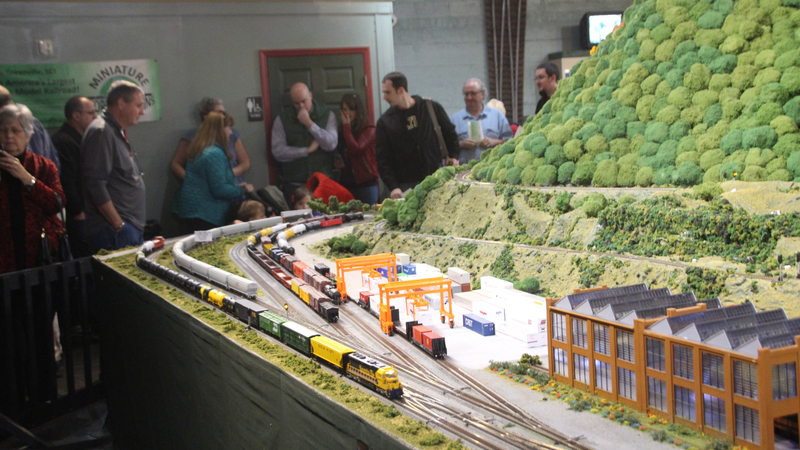 "Wonderful"It is amazing to see the miniature trains in there! I have taken my family and they loved it. The owners are very enthusiastic and engaging, willing to answer any questions. I think this place adds a great deal of charm and personality to Greenville, I hope more people learn about it! 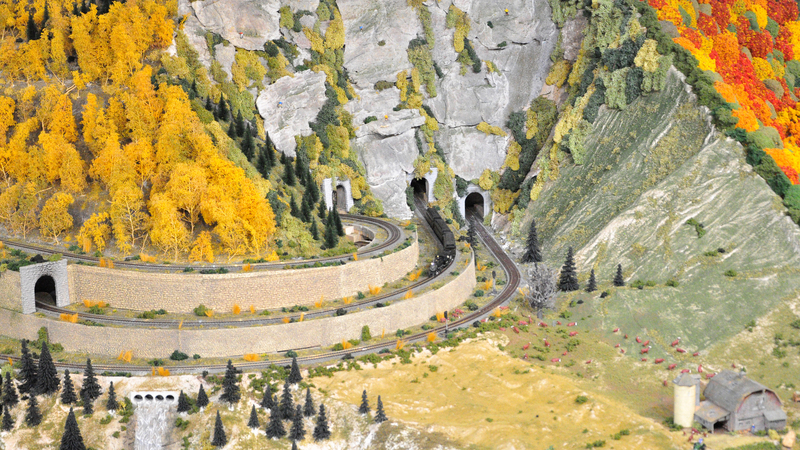 Wonderful layout, Everyone needs to experience this never ending enjoyment that anyone, young and young at heart, you won't regret the amazing scenic vistas of a 40 foot by 45 foot with 12 foot 6 inch mountain and piedmont landscape with buildings and replicas that will amaze! 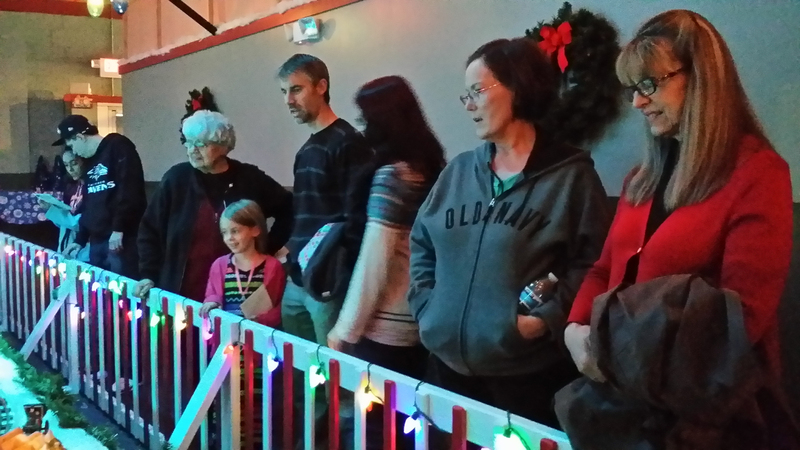 I teach at Carolina High School and I came to the museum in December with my granddaughters. ...My granddaughters LOVED the museum and they wore their hats all weekend long!! Great place to go if you enjoy trains. Fun activity on Christmas Day with family. They had two scavenger hunts for the holidays. 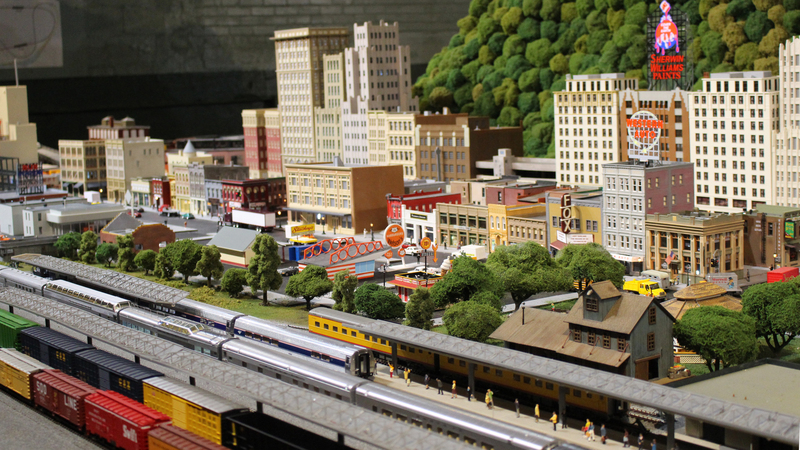 The museum of model trains is a must see in downtown Greenville,SC. It is run by an all volunteer staff and the displays are fantastic. 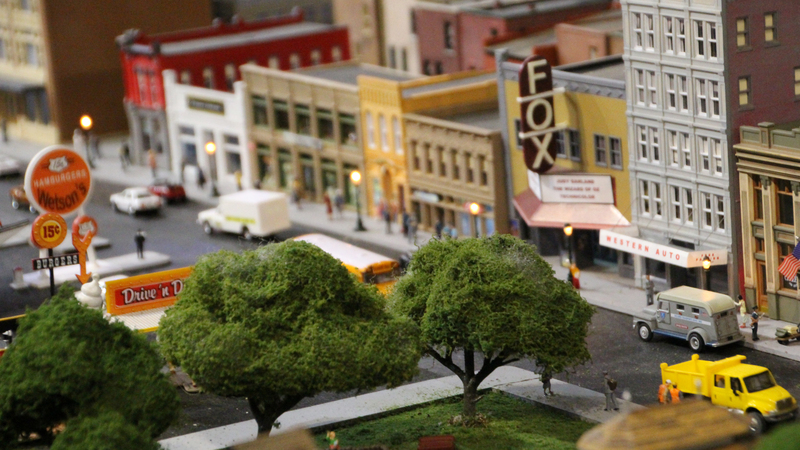 The main display room has several trains running simultaneously on several tracks and the background scenery, including towns, model cars, and people are very realistic. The street lights even light when they darken the room. If you ever wanted to be an engineer you can go inside the mountain and direct trains using one of the computers that operate the system. 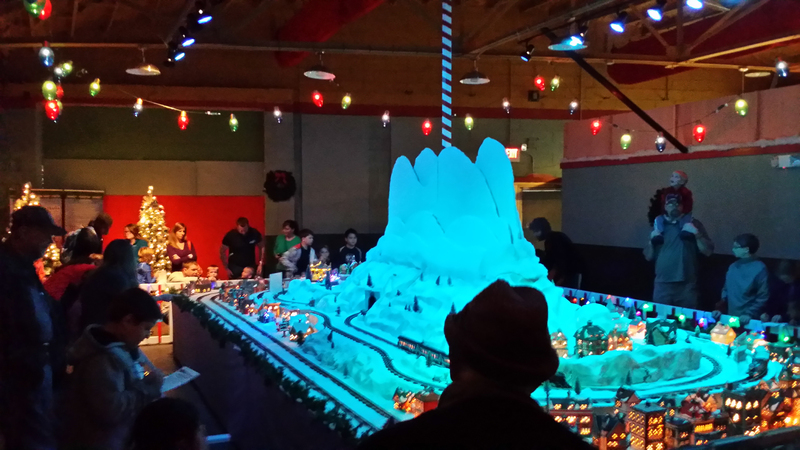 There is a second room that is set up with trains and all the background is made to look like Christmas time. Whether or not you have children it is a great attraction in the heart of Greenville. My son loves all things Thomas the train. I heard about this hidden gem which is downtown Greenville (a stone's throw distance from the Falls Park bridge) I recommend that you come visit during the Christmas holidays. There are two main displays during the winter months. 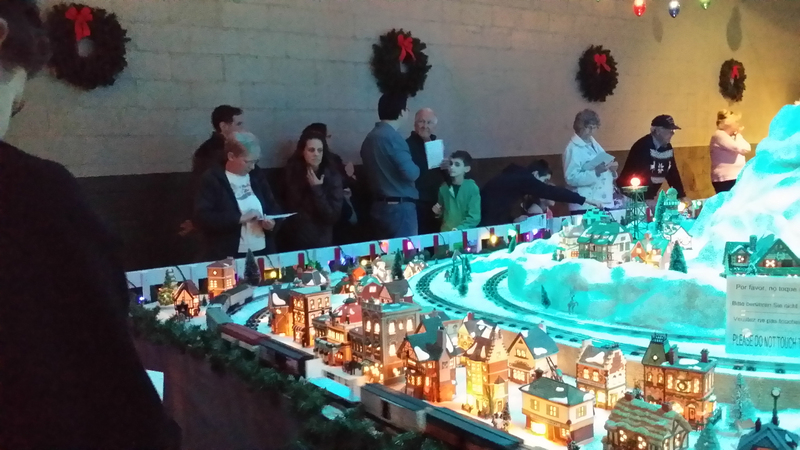 The first display is the Christmas featured train display. There is a room about 500 square feet with a snowy mountain scene. There is a holiday themed scavenger hunt that my son and I enjoyed doing together. (The theme was primarily based on Frozen and Rudolph) After about 45 minutes of walking around the Christmas display, we headed over to the second display. The second display is much larger (probably 1,000 - 1,500 square feet. There is a giant mountain in the center, an entire town, roundhouse, neighborhoods, etc... If you remember Mr. Roger's Neighborhood's opening scene, it brought back a lot of memories. There were train tunnels, bridges, and lots of scenery that made it very enjoyable. I think I enjoyed it a bit more than my son. After walking around the second display (which is the one that is there year round) for another 30 minutes, my son was ready to go. 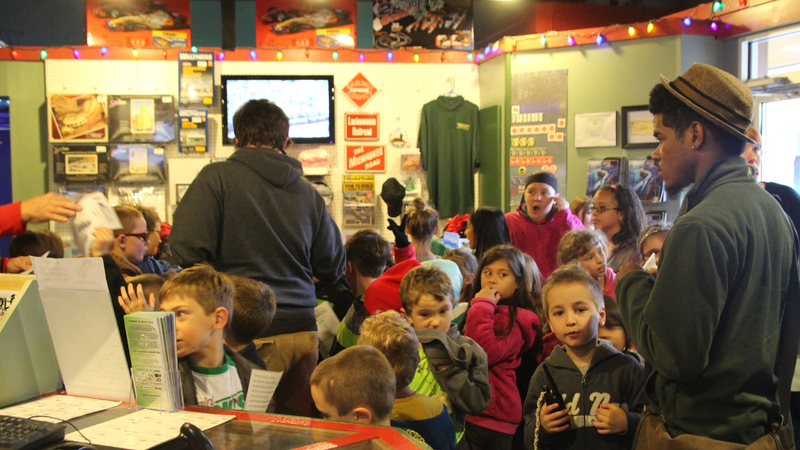 The scavenger hunt for the second display was geared towards older kids (i.e., how many_____ are there). When we went, it was $5 per child, and $7 per adult. I think it was worth it, especially since we got two displays for the price of one. My favorite was actually the Christmas display. I think you should plan on spending an hour to an hour and a half (depending on age of child/attention span). We loved having you on the show!! This place was started by a group of train lovers who also volunteer there as workers! Can't beat that awe factor. Everyone was very nice and the trains were also very cool, even for a pack of adults haha. I could only imagine how much cooler this place would be as a kid! While this place is not huge, it is just enough to get the full amount of train watching in ( and helpful to not lose a child in). Enjoyed the seasonal North Pole set up for Christmas. Our two year old had to be dragged out. Love the Christmas setup! 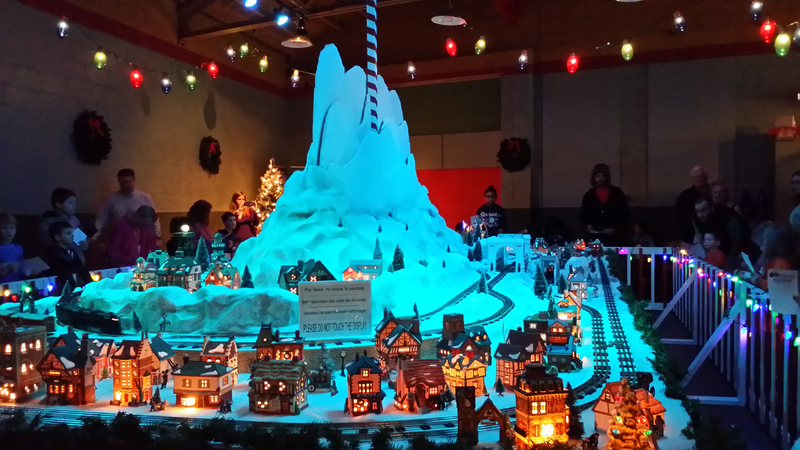 Loved the Christmas and the model railroad. You have kept model railroading alive. Visited the train museum today. Great way to spend an hour or two, if you have children or love trains, or both! Need to take my Grands. Jacob, Sommer and Ethan Maybe Savanah (she might be too grown up for this) not!!!!! TCS Train Control Systems- "impressive layout"
We spent a couple of hours exploring the display and had a great time with the Scavenger hunt. I thought it was awesome!! 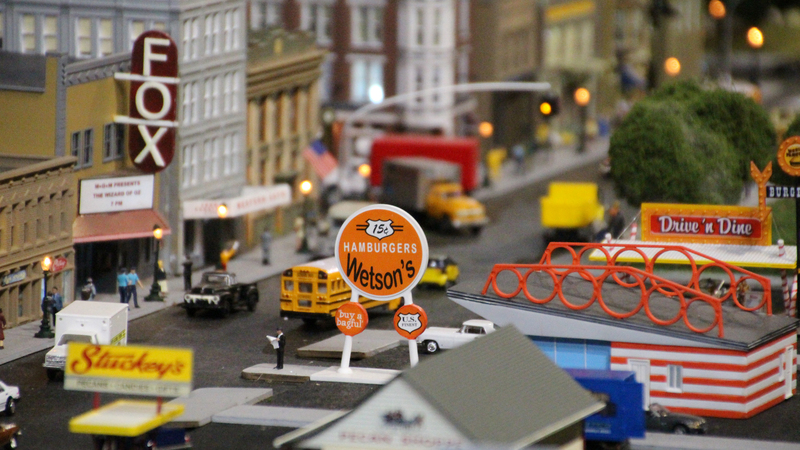 We visited the Miniature World of Trains Museum today, and the kids loved it. For those of you that visit Greenville, be sure to take some time to visit the museum. If we lived in SC, we would visit more often. When we return to SC for a visit, this museum will be on our to-do list. Thanks for entertaining my kiddos!!! 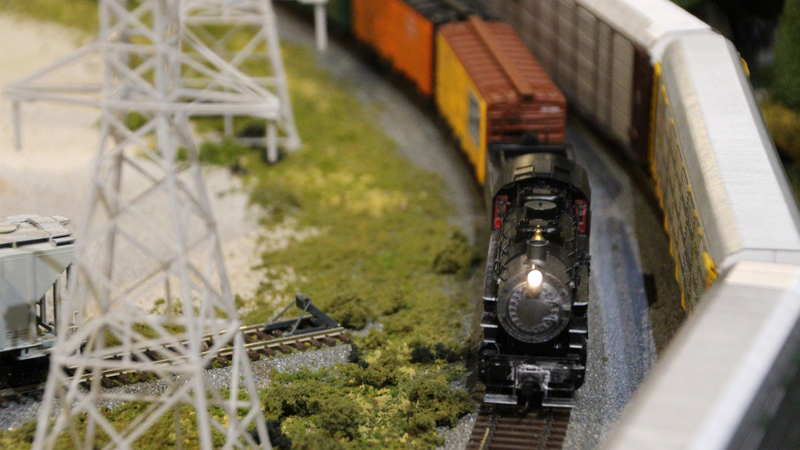 I took my kids to the Miniature World of Trains in Greenville yesterday. They had a great time and keep talking about when we are going back and taking mom with us. The layout is very impressive, with several different trains running at once. The small city, as well as the countryside, represented have many neat little features (animated signs on some of the buildings, wildlife such as deer and bear, farm animals, zombies walking through the streets of the city, lighted buildings, etc.). My kids really enjoyed the scavenger hunt that they give you upon entrance and helps to point out these features and many more. 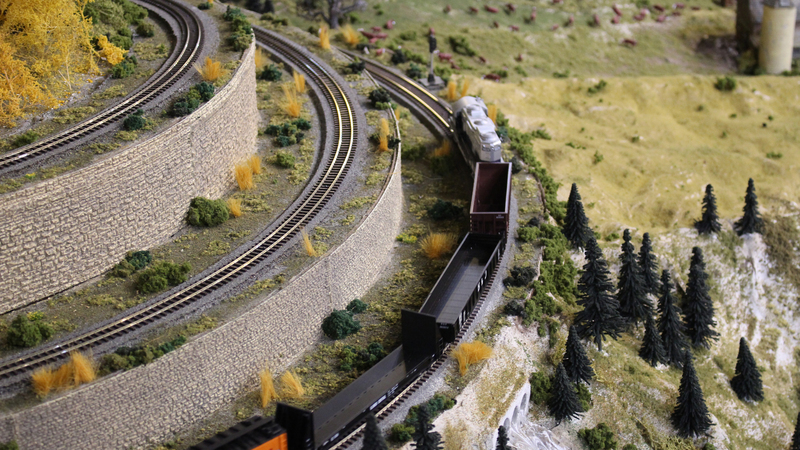 The volunteers are very friendly and helpful, and extremely knowledgeable about the layout. They have a few displays in the back, showing real-life railroad artifacts. This attraction is still in its development stages - I am sure that once it is totally finished, it will be one of the top attractions in downtown. They do a special Christmas train during the holiday season. We really enjoyed it and look forward to going back. 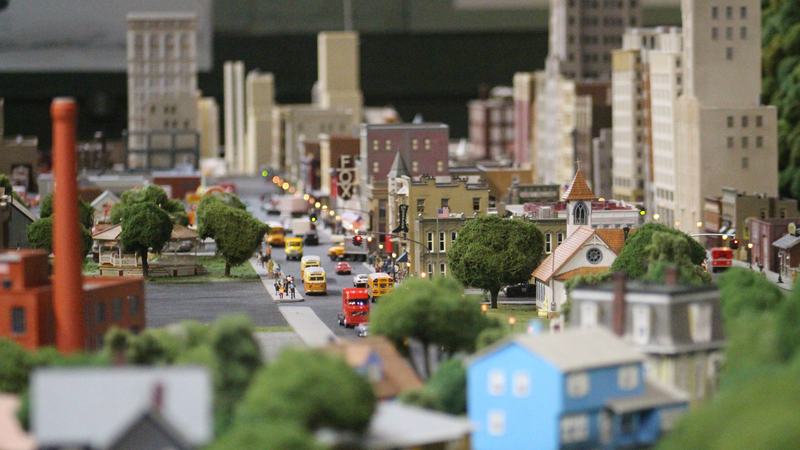 We enjoyed a wonderful visit to the Miniature World of Trains earlier today with the whole family! We visited MWOT on a Saturday in the early afternoon with a large family of boys and girls ranging from 12 years old to 4 years old. As we walked up to the door, train sounds played over some outdoor speakers, beckoning you inside. At $5 per person, it's really reasonably priced for such a fun and unique experience in downtown Greenville. An absurd earlier review commented that it should be free. Give me a break! As I said, we got a lot of fun for a small admission fee. Once inside, we took in the huge train display. It was amazing. 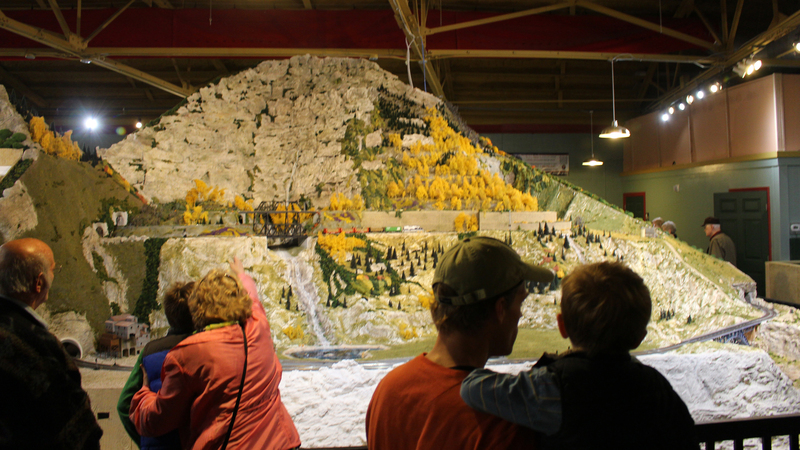 The mountain range of the display climbs to 12 and a half feet high. 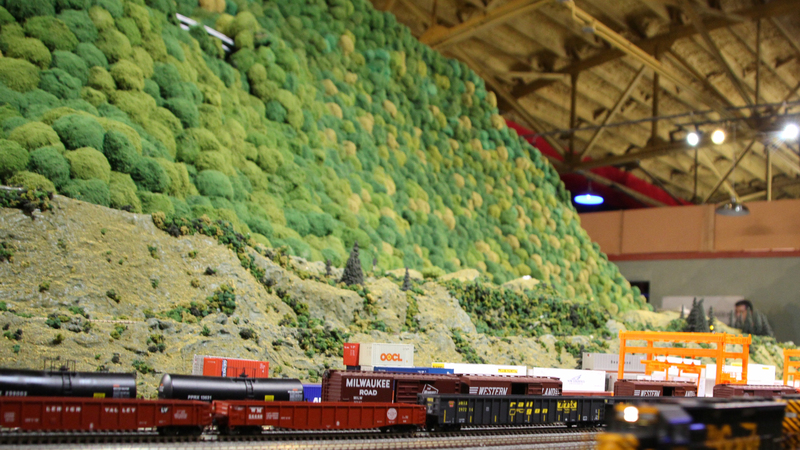 The trains run around the base of the display, as well as at several different heights on the mountain. 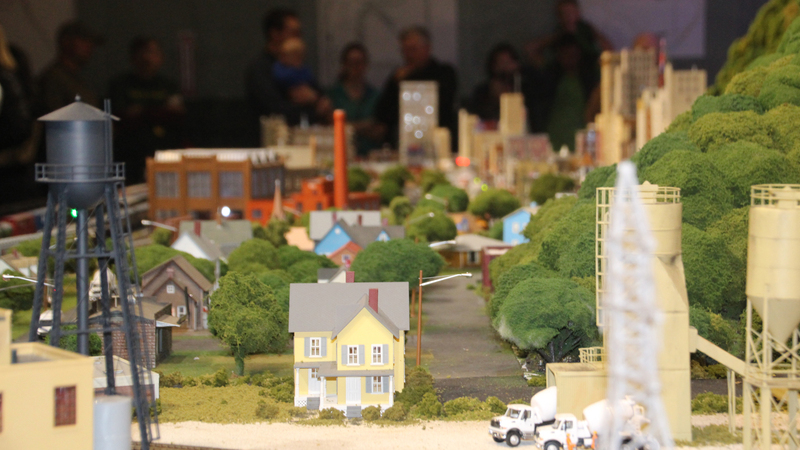 The display is divided into several different areas, including a cityscape, a trainyard, and a wilderness / farmland area. Many tunnels cut through the mountain here and there to allow passage for the trains from one area to the next. There is so much to see here - you just have to look! There are several notable things about the display that you should be sure to see. I loved the cityscape. 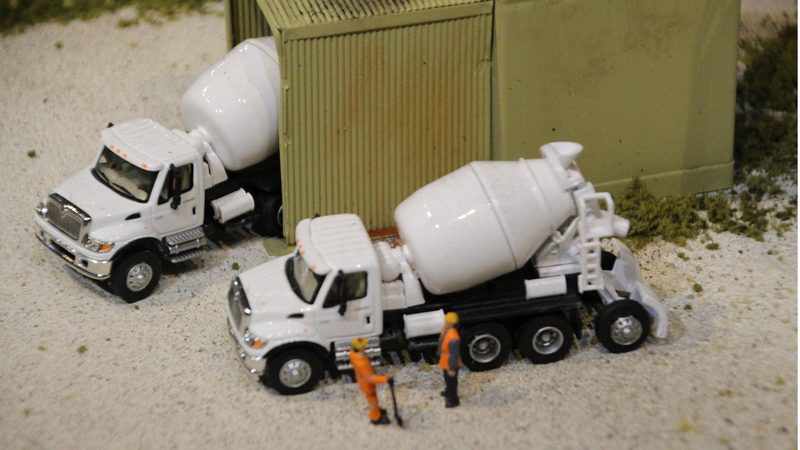 There were buildings, vehicles, people, trees - the whole works. It even had working traffic lights that were tiny! They were smaller than a dime but still had the green-yellow-red sequence that lit up correctly in each direction. As you walk around the display, speakers play sounds of train radio chatter - pretty cool! And it's really amazing what the computers they have can do with the display. Trains pull into a station and stop while a different train gets underway for a lap. Then that train pulls in and yet another train pulls out for a lap. You can see trains stop to let other train traffic go by before they continue on their way. I have to say, my favorite part of the display is when they turn the lights off to simulate night. Lights shine in the windows of the city buildings, train traffic signal lights are more easily seen, and they even have animated billboards! Tiny little billboards that go through a light sequence as they spell out the name of their company! They turn off the lights about once an hour for maybe 10-15 minutes. To help you take in the whole train display, there is a scavenger hunt that my kids absolutely loved. You can grab a scavenger hunt sheet on your way in if you like. There are about 15 questions on the sheet as I recall, and they are all meant to engage you in the display. How many cows are on the farms? How many restaurants are in the city? How many zombies (yes, zombies!) are in the city? One hint: some of the questions are meant to get you to interact with the wonderful staff of volunteers here at MWOT. (Such as the height of the mountain.) 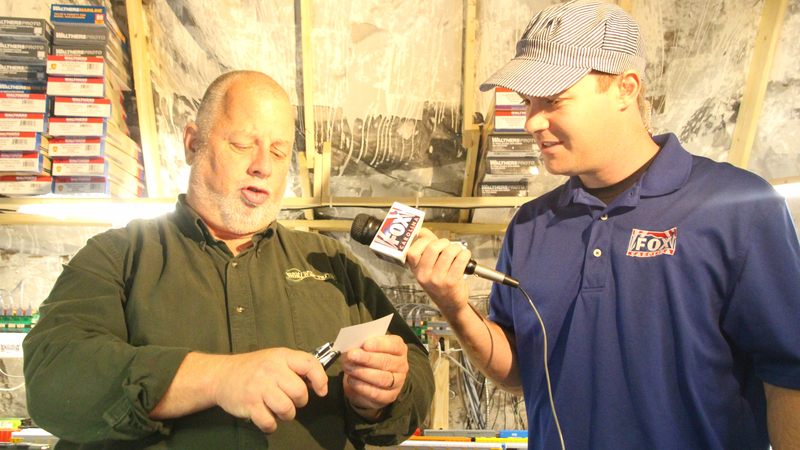 The staff loves to answer questions about the display, the trains, the future plans for MWOT - anything. And they really enjoyed interacting with my kids, no matter how repetitive or absurd the question was that they got. I should take a moment to mention that the MWOT also has a museum area with some items of interest from the history of trains, as well as some items available to purchase in the front lobby/ticket area including beginner trains sets. Also, they are testing the concept and hope to have a good enough response to move to a larger location and have larger displays. 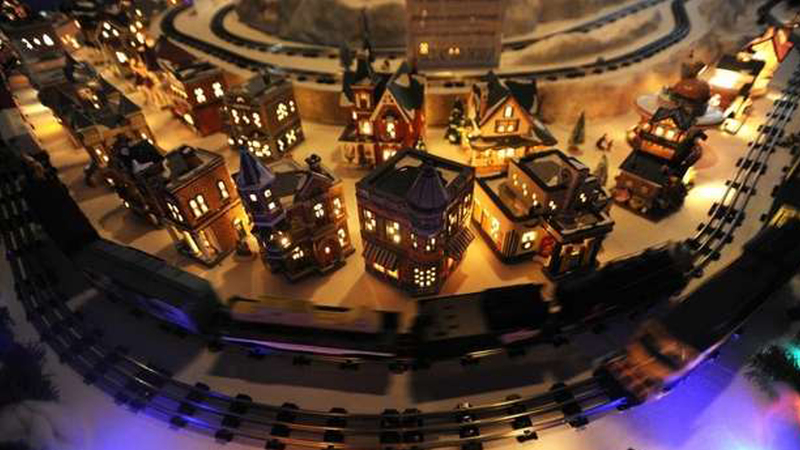 And finally, they have a delightful holiday train display around November and December that you simply have to come see. So, if you wanted to come in and only spend 10 minutes walking around, you certainly could. Quite frankly, you could do the same thing in the Sistine Chapel or at the Louvre if you were so inclined - you would probably enjoy it, but you would also miss an awful lot. Instead, I recommend that you come in and give it a good hour, or at least enough time to cycle through a nighttime sequence. Do the scavenger hunt with your kids (or by yourself!) to get them to notice some of the minute details they put into the display. Take a look at the museum items. And one of my favorite things - hold your camera steady on the rail that circles the display and get a video roll of a train rolling by. Then look at it later and see how real it looks. 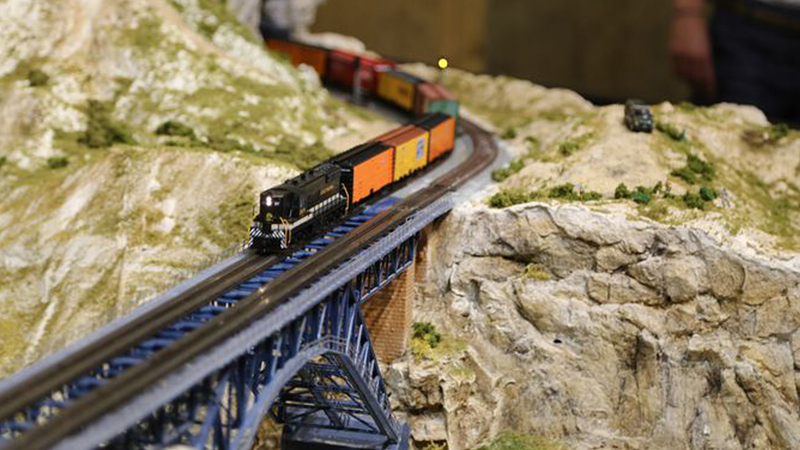 However you decide to spend your time, the Miniature World of Trains is worth a look! We enjoyed our trip immensely. The guides were knowledgeable and friendly and the exhibit is amazing. It took us a while to see everything. We wished we could have come back for the special sunset effects on Saturday. It's well worth a look in! I I dabbled in model trains many years ago and was curious about this place. I have to say I was impressed. 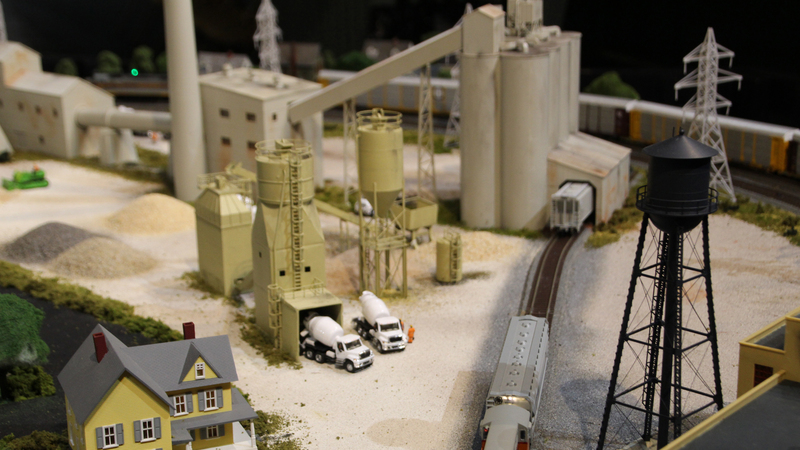 Even if you don't have much interest in model trains you might find this exhibit pretty cool. The already awesome Falls Park and West End area of Greenville just got a little bit better! I visited this display today during a trip to Greenville. 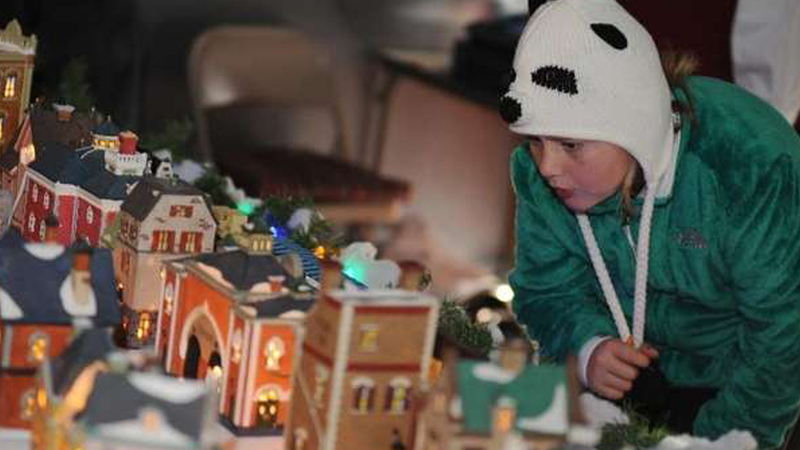 Kids and adults will both enjoy the "scavenger hunt" to find details hidden within the model railroad. 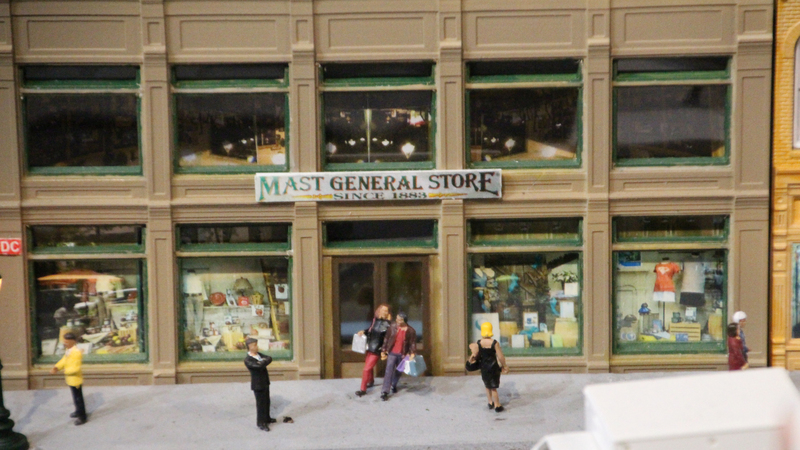 Familiar local landmarks (like a model of downtown with Mast General Store) are visible in the railroad display. It also has western Rocky Mountain and eastern Smoky Mountain sections. 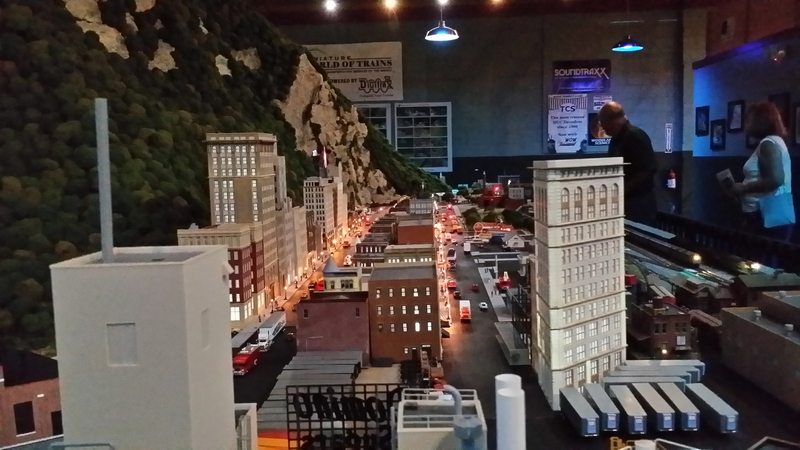 The model railroad has computer controlled trains and switches to allow various trains to make realistic starts and stops and traverse the display realistically instead of running in a constant loop like most other displays. The staff is passionate about the "temporary" beta model railroad and museum they have built and I'm impressed with the result. Can't wait to see what this crew can build if they are successful with a future move to a larger facility. It's a little off Main St. on Camperdown and a little hard to see from Main but it's definitely worth finding if you're in the area. 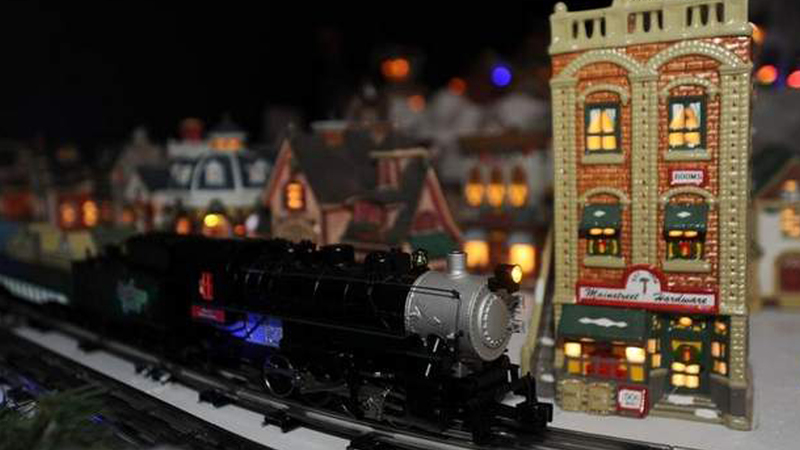 The Miniature World of Trains is a must see for anyone with children 2-12 and all adults that remember watching the trains at Christmas! It's inexpensive and a great rest stop while wondering around downtown Greenville. Don't miss it! I visited on a Friday morning, with my wife, during a weekend stay in downtown Greenville. We were greeted at the door with a smile and a brief description of the attraction. 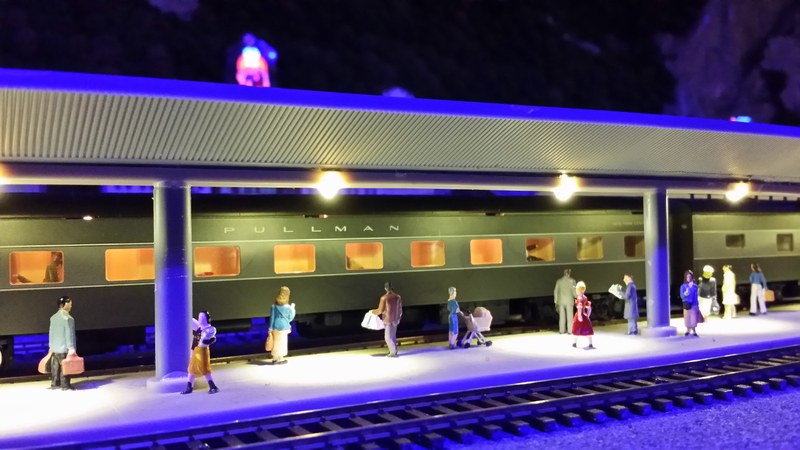 Upon going inside, I was amazed at the quantity and quality of the models and trains on display. The layout is nicely arranged, with lots of variety. 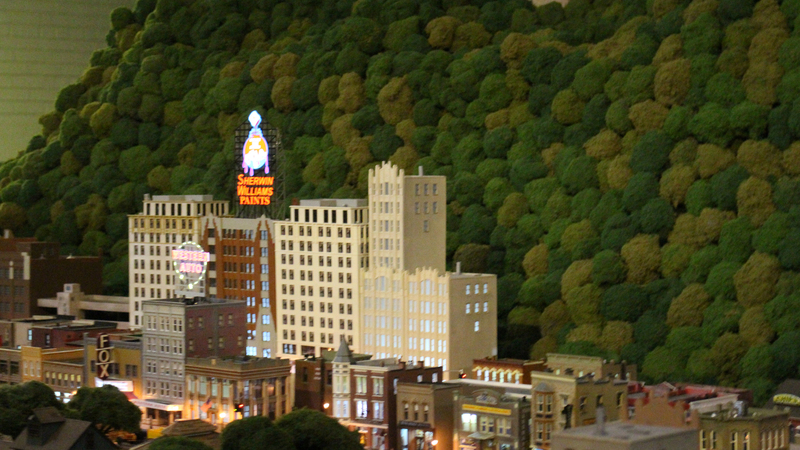 I especially loved the local landmarks produced in miniature form. I took lots of photos, and had a nice conversation with one of the volunteers. We had a great time. I would definitely recommend a stop here, especially for families. This is a brand new attraction in downtown Greenville, SC. We happened to visit on their "beta" day. The "Grand Opening" is in late April. They are trying to make something very cool here and we really enjoyed the opportunity to see what they had to offer, even if everything didn't go exactly as planned. Any model train buff will get a real thrill out of this display. 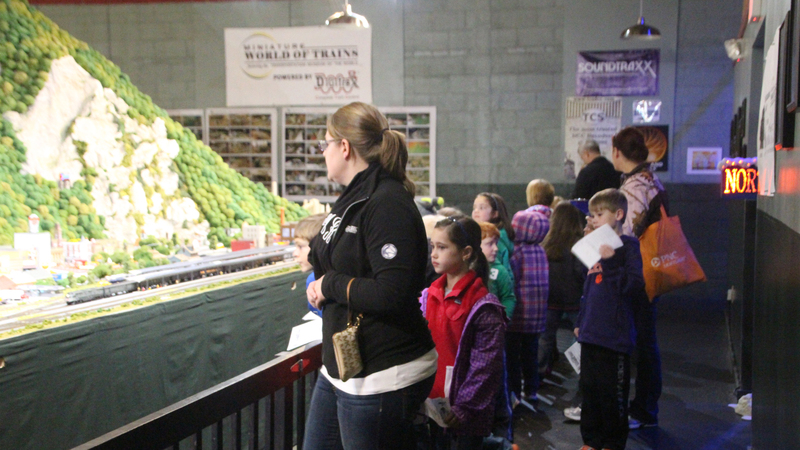 "It's a new gem in Greenville"
If you're a fan of trains this is the place for you. 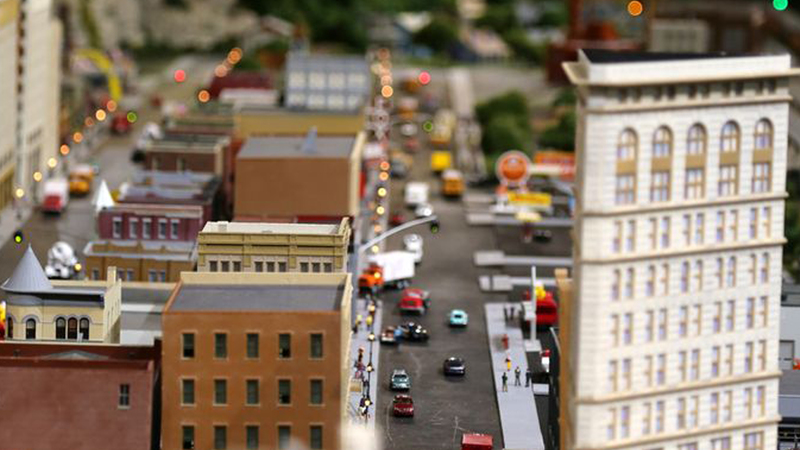 Miniature World of Trains, located right across the road from Falls Park, is a scale model train display created by a lot of hardworking people. At this point the people working there are all volunteers devoting their time to something they love. While it isn't a huge display right now there are plans for the future to expand. 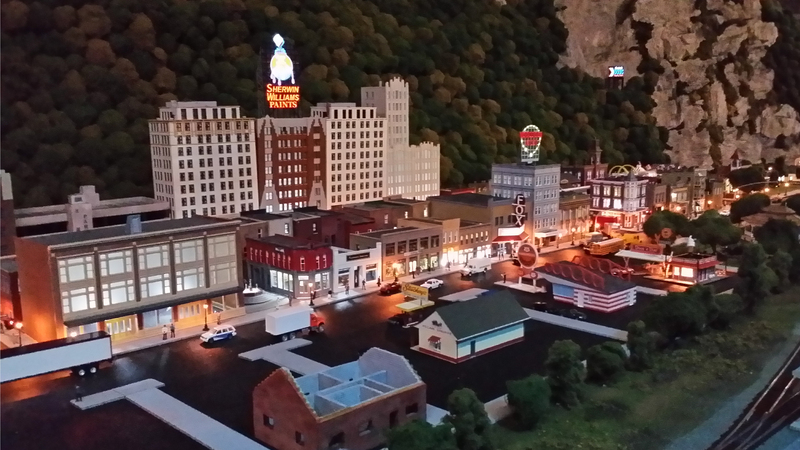 The space now has an HO scale model with many aspects of the surrounding towns and areas as well as a space for parties. The model itself is really cool with a lot of details that you have to look for. The first area you see is Greenburg which is a combination of Greenville and Spartanburg. 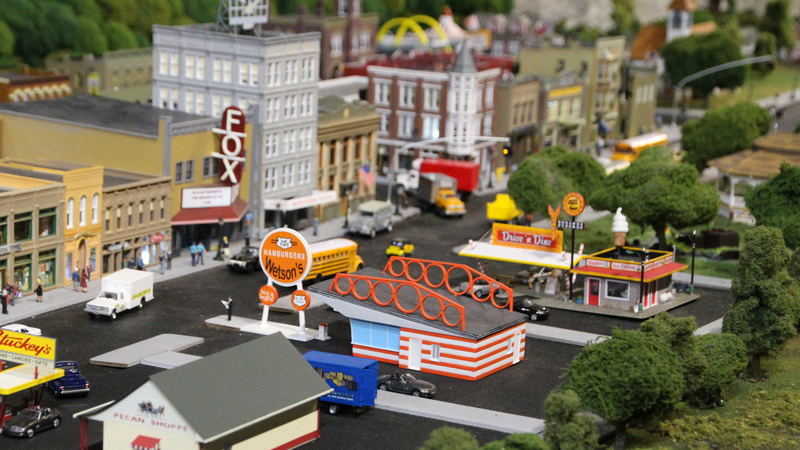 In this town is a model of Mast General Store and the Fox Theater. If you look hard enough in this area you can find two zombies wandering through town. In the background is Table Rock. As you move around the display you come across the trees changing color as well as more mountainous scenes. If you look close enough you can see rock climbers climbing the side of one of the mountains. This museum is great for kids and adults alike. My son, Will, came today and really enjoyed himself. Greenville is a medium size city completely lacking when it comes to museums that will drive tourism. 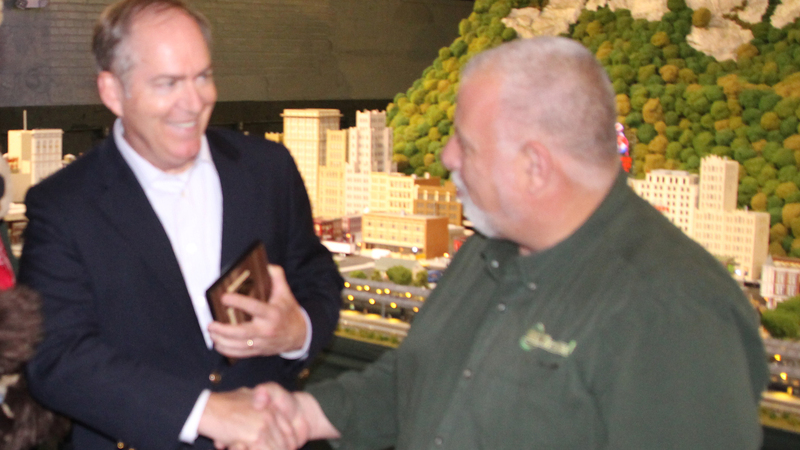 This transportation museum, especially with model railroads and trains, will drive tourism and be a positive influence on Greenville. I'm excited the downtown location has been chosen. Learn from the past, enjoy the present, and build for the future. A perfect addition to the community!!! Anything which brings tourist dollars needs to be supported by both Government and the business community. Awesome project, I would bring my family again and again, as well as donate myself. Great idea and needed. Keep going! Great opportunity for Greenville and the surrounding area - good family fun, great for local business, educational - great value. I am already supporting this project as a volunteer and donor. I believe that the museum will be an attraction for the local area and for South Carolina. I look for train layouts that are open to the public everywhere I go; and they are always very popular. The children (and many adults) of SC love this. It is a wonderful learning experience for children as well as for adults. Railroads played such an important part in the history of this county. Annette Ruby: The museum is a great asset to the area and people from around the world should come to visit. This is a fun project of great vision and value to the community. It is worthy of our support. Mike Gilley: This is being modeled after a highly successful museum in Germany. It is nice to see an attempt to pull together the various modes of transportation supporting the emphasis on trains. Glenn Hayes: This is needed. People don't know that a train has the right of way and can't stop fast. 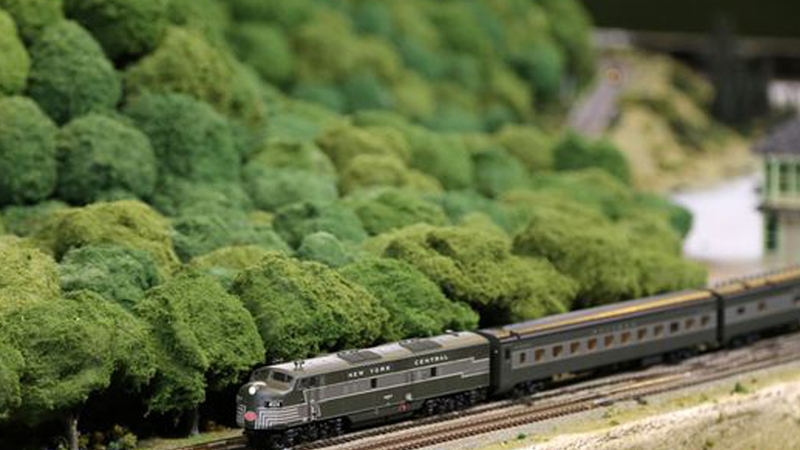 This miniature World of trains would be a great show for our area and the whole country who come to visit. This museum will bring together adults and children from our community, neighboring states, and our overseas friends on business trips. 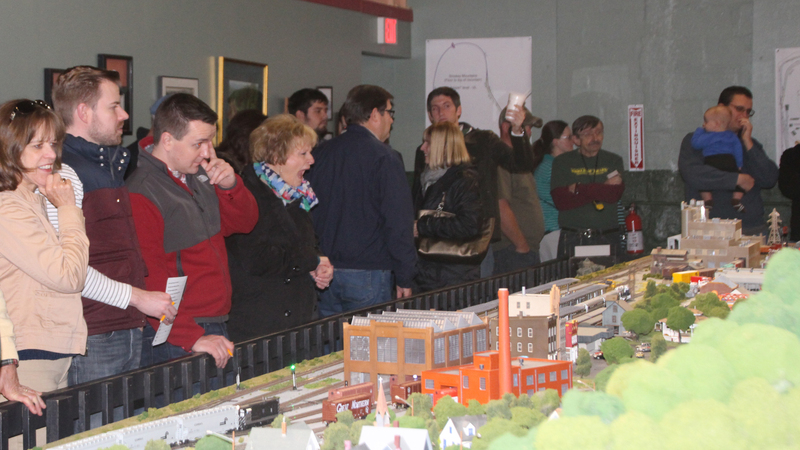 The train museum will educate in the various aspect of how our transportation system works hand in hand and be a beneficial asset to our town. This project will not only benefit the Upstate South Carolina area but the entire Southeastern United States. 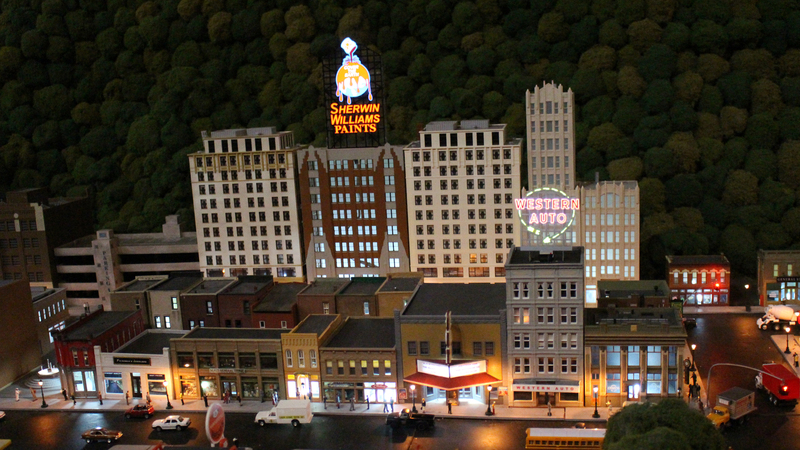 A project of the magnitude will draw people from all areas of the US and other countries, just like Miniatur Wunderland in Hamburg, German. This project would make Greenville someplace special for the residents and visitors. This will be a wonderful thing for the community. This will be another unique experience that Greenville offers visitors of all ages, and a great way for locals to entertain and treat out of town guests. ....something the kids would love to see! When we travel to other places we always look for museums like this. ...fun and great learning place! With all of the major international companies ,i.e. Michelin, BMW, and ICAR, who I don't see on the donations list, I'm surprised they haven't jumped on the bandwagon and support such a worthy cause to bring more information and education about the history.